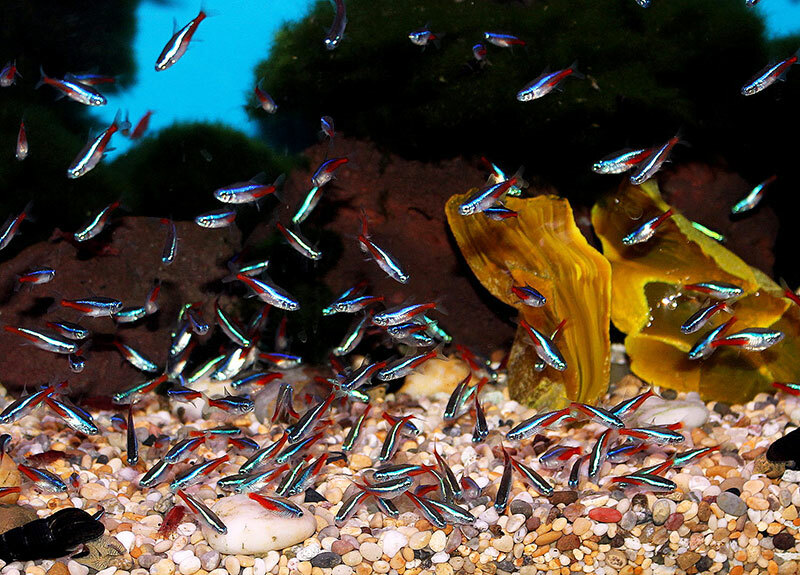 The Neon Tetra Paracheirodon innesi, has a long history in the aquarium hobby. It created a stir when first introduced in the 1930s and is still sought after by aquarium enthusiasts today. 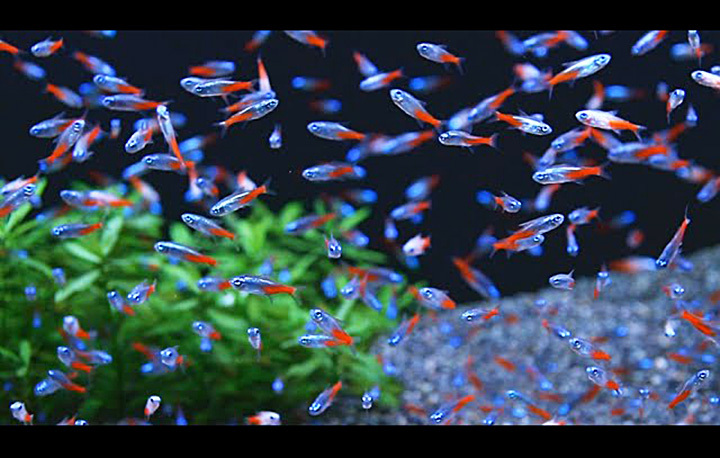 A school of flashing Neon Tetras makes a brilliant display and will liven up any peaceful community tank. In nature, these fish inhabit the slow-moving tributaries of main rivers. These are regions of black waters beneath dense forest canopies that allow very little light to get through. Neon Tetras live in shoals mainly in the middle water layers and feed on worms and small crustaceans. 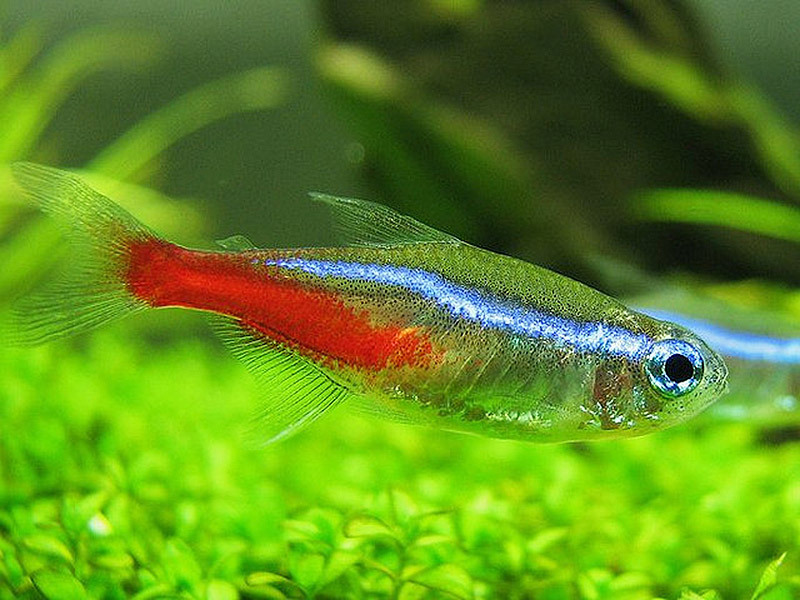 Neon Tetras are now generally all captive-bred, with most coming from the Far East and eastern Europe. 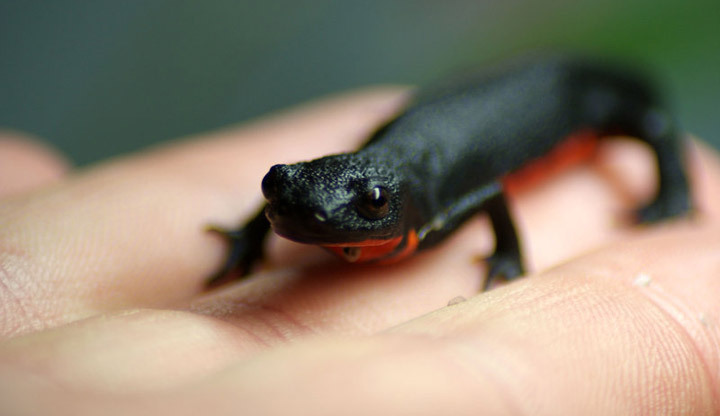 Several varieties of captive-bred specimens are now available. These include the Long Finned Neon Tetra, though it is rather rare, as well as a “golden” strain that is basically a semi-albino variety, and a “diamond” Neon Tetra that appears sprinkled with metallic scales along the top portion of the body. 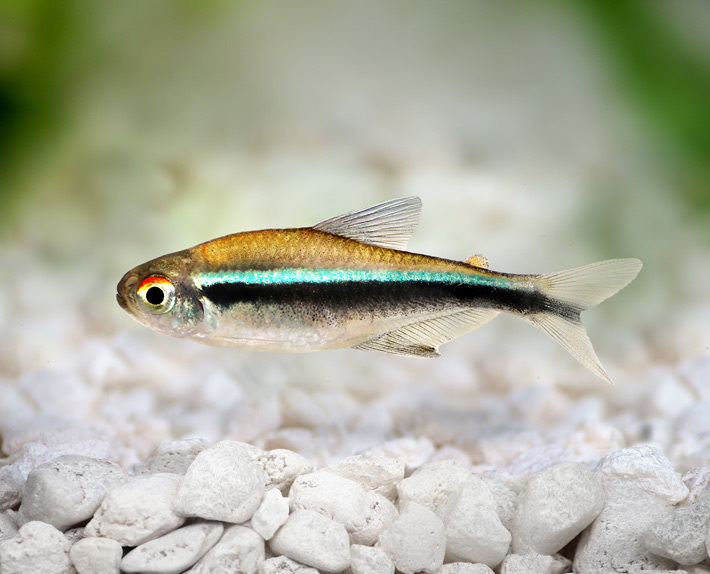 The Neon Tetra is a small, slim-bodied species of tetra. This fish will reach about 1.5 inches (4 cm) in length and will generally live 5 to 8 years in the aquarium, though it may live up to 10 years. It is similar in appearance to the Cardinal Tetra with its horizontal stripe that seems to glow, but these are distinctly different fish. Both tetras have a very beautiful red stripe next to an electric blue neon stripe. However, the red stripe only runs halfway up the body on the Neon Tetra but the full length of the body on the Cardinal Tetra. Lifespan: 10 years – Neon Tetras can have a lifespan of up to 10 years though they generally live about 5 to 8 years in the aquarium. The Neon Tetra is a durable fish that is a good choice for the beginning fish keeper. They are commercially-bred in huge numbers, so they are adaptable and will thrive in most well-maintained tanks. This fish is very hardy in general but will be markedly more delicate in the first week or so after being introduced to a new tank. Hobbyists should also be aware of the incurable Neon Tetra disease. Since they are omnivorous, Neon Tetras will generally eat all kinds of small or finely ground foods–live, fresh, and flake. To keep a good balance, give them a high quality flake food every day. Feed brine shrimp (either live or frozen) or blood worms as a treat. These tetras like several feedings a day, but offer only what they can consume in 3 minutes or less at each feeding. The Neon Tetra is easy to care for provided the water is kept clean. Aquariums are closed systems, and regardless of size, all need some maintenance. Over time, decomposing organic matter, nitrates, and phosphate build up, and water hardness increases due to evaporation. To combat these ever-changing conditions, water should be replaced on a regular basis, especially if the tank is densely stocked. At least 25 to 50% of the tank water should be replaced every other week. The Neon Tetra is active and does best in a school with 6 or more of its own kind. A school will be comfortable in a 10-gallon aquarium. Though they are somewhat less demanding about water conditions than the Cardinal Tetra, they should have peat-filtered water. These fish also prefer to have a bit of a current to swim in, and this can be accomplished with canister filters or powerheads. Make sure the intake of the filter is such that these small fish do not get sucked into the filter. Cover the intake with mesh or some foam filter media to prevent any accidents. Dim lighting will develop this tetra’s best coloring. These fish prefer some plant cover and a darker gravel. A biotype setup is a great choice for this tetra and is very easy to put together. For the substrate, use a river sand with some drift wood and twisted roots. Add some dried leaves to the tank, which will stain the water a light brown, and replace the leaves every few weeks. Minimum Tank Size: 10 gal (38 L) – A 10-gallon tank is sufficient to hold the small school this species requires to be comfortable. 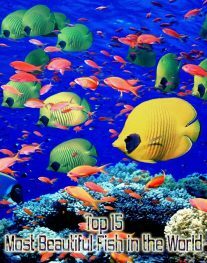 Breeding Temperature: 75.0° F – Recommended breeding conditions: pH 5.0-6.0, 1-2 dGH, temperature 75° F.
Water Region: All – These fish will swim in all areas but tend to favor the middle of the aquarium or wherever the most swimming space is. Neon Tetras are ideal for a community aquarium with other peaceful fish. It is best not to keep them with fish that are larger or aggressive, like angels. Good tankmates include other small tetras, hatchet fish, pencil fish, Corydoras, smaller rasboras, and peaceful barbs. They are most comfortable and show their best colors when kept in a school of 6 or more fish. Same species – conspecifics: Yes – This fish is fairly active and social, and it should be kept in a small school of at least 6 of its own kind. The male is more slender than the female, which makes the blue line appear straighter. The rounder body of the female produces a bent blue line. The Neon Tetra has been bred in captivity. They are considered somewhat difficult to breed, though easier than their cousin, the Cardinal Tetra. Success has been had, however, by using especially soft acidic water along with intense sterilization of the breeding tank and everything used in and on the tank. With compatible breeding pairs, and given the right conditions, these fish will even spawn in a community tank. Unfortunately the eggs and fry will most often be eaten, so a separate breeding tank is best. They are egg layers and will breed at about 9 months of age. They can be bred as pairs or in a school, but it is best to condition the fish prior to breeding with plenty of small live foods. Select a breeding pair or small group and transfer them into the breeding tank. A mature female’s belly will become nicely rounded when she is full of eggs. Choose males that are displaying their best colors. For a school, there should be at least 5 fish with a ratio of 2 females per each male. The breeding tank can be as small as a gallon for a pair or up to 20 gallons for a school. The water should be shallow, around 5 to 6 inches deep. Keep the tank dimly lit with about 1/2 inch of rock substrate and some clumps of fine textured live plants for a spawning medium. A good breeding temperature is 75° F (24° C), soft water with hardness between 1.0 to 2.0 dGH, and a pH between 5.0 – 6.5. A small, air-powered sponge filter is need for filtration and to provide a gentle water flow. They usually spawn early in the morning and the females will generally lay up to 130 clear, barely sticky eggs. The eggs will be scattered, and the parents will eat them if not removed. Both eggs and fry are especially sensitive to light, and the eggs are also prone to fungus, so kept the tank dimly lit during the early stages. The eggs will hatch in about 24 hours with the fry becoming free swimming about 3 to 4 days later. The fry can then be fed liquid fry food or infusoria until they are large enough to eat baby brine shrimp. Ease of Breeding: Moderate – This fish is often unwilling to breed in the home aquarium though good results can be achieved when spawning is induced. 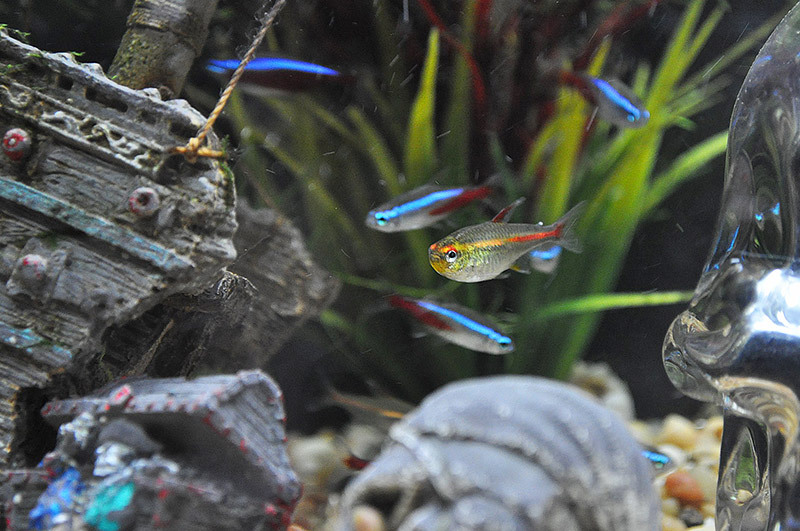 The Neon Tetra will resist disease as long as the tank is kept in a clean, stable condition. 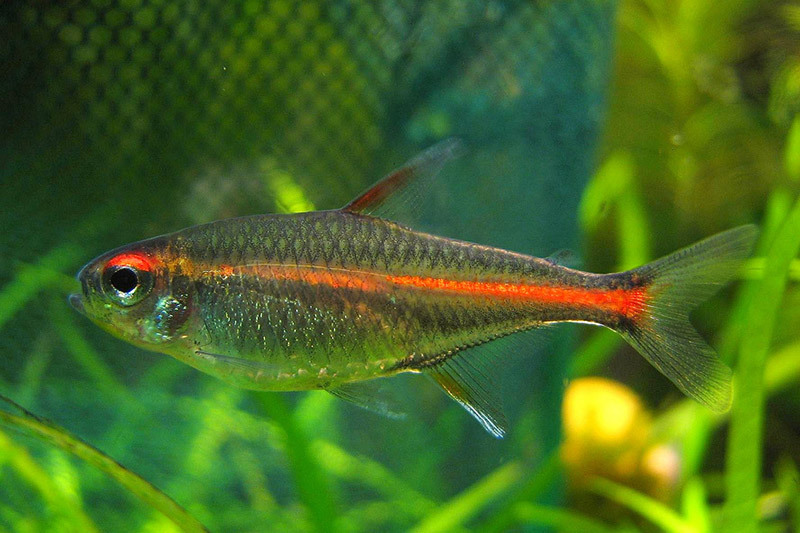 The worst fear of a tetra keeper is the Neon Tetra Disease, an essentially incurable and a highly contagious disease of unknown origin and cause. It was first diagnosed in Neons, which is how it earned its name, but it can actually affect many other species. Neon Tetra Disease has been identified as a microscopic sporozoan in the genus Plistophora. It shows up on the fish as a spreading spot or blemish beneath the dorsal fin. Attempts to cure this disease with the use of Methylene Blue have not always been successful, so the disease is considered incurable. This disease has also been spotted on the Glowlight Tetra Hemigrammus erythrozonus, and the Rosy Tetra Hemigrammus erythrozonus. A good thing about this tetra is that due to their resilience, an outbreak of disease can often be limited to just one or a few fishes if you deal with it at an early stage. It is common for all fishes to be infected even before the first warning signs can be noticed. The best way to proactively prevent disease is to provide the proper environment and give them a well balanced diet. The closer to their natural habitat the less stress the fish will have, making them healthier and happy. Stressed fish are more likely to acquire disease. As with most fish, the Neon Tetra can be prone to skin flukes, parasitic infestations (protozoa, worms, etc. ), ichthyobodo infection, parasitic infestations (protozoa, worms, etc. ), bacterial infections (general), and bacterial disease. It is recommended to read up on the common tank diseases. Knowing the signs and catching and treating them early makes a huge difference. 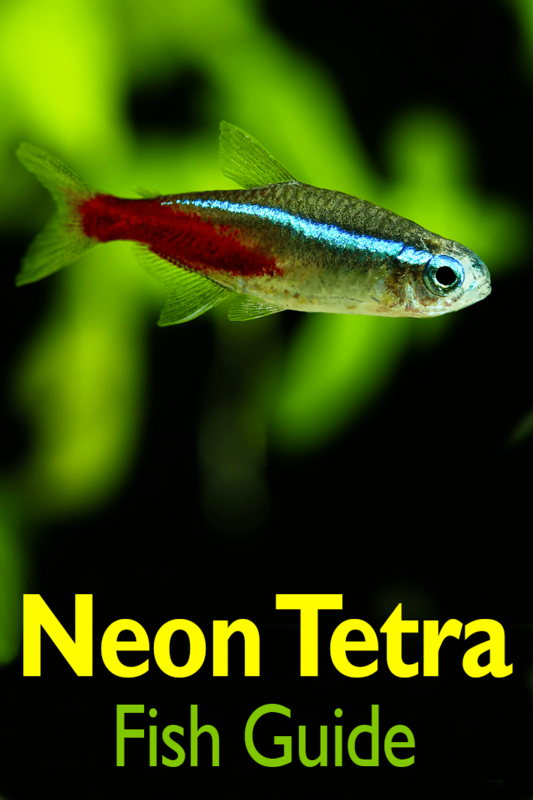 The Neon Tetra is readily available and inexpensive.